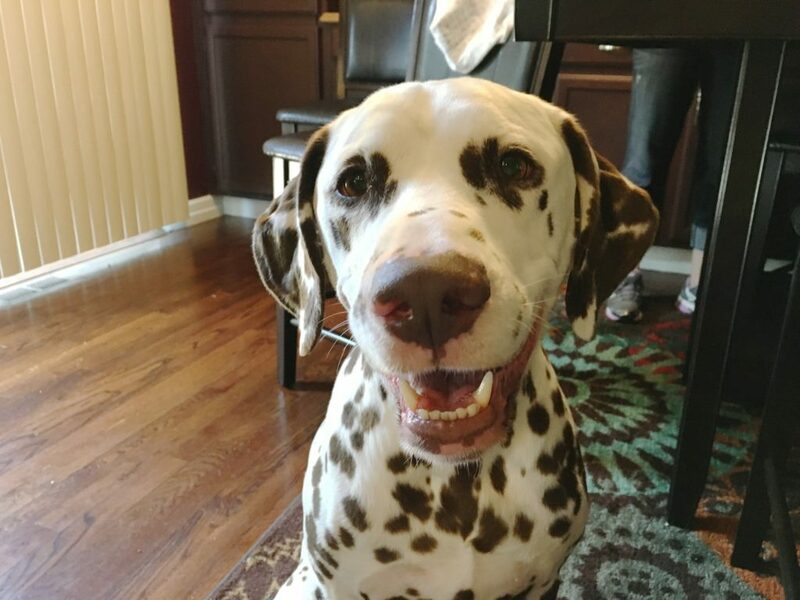 Wrigley is a five-year-old liver Dalmatian who lives in Omaha. His guardian set up a dog obedience training session with me to stop him from getting overexcited, jumping up on people, counter surfing, door dashing, pulling on the leash and a dislike of being told to go into the kennel. Wrigley caught me a little bit by surprise during the greeting. While it was clear he was excited, there was a little bit of territoriality to his barking. He was very much giving me a warning. But once I got inside, Wrigley’s demeanor changed considerably and he adopted a much more relaxed energy and body posture. His guardian mentioned this was a normal behavior for him; sounding aggressive until the person came inside with an invitation. Later in the session I gave his guardian some non verbal communication tools that she can use to move him away from the door before opening it. This should help him adopt a softer behavior when guests arrive while also deepening his respect for eh humans as leaders. When I sat down with his guardian to discuss what she wanted to accomplish during the session, I noticed that Wrigley showed absolutely no consideration for anyone’s personal space. While there’s nothing wrong with a dog being close to us, the way Wrigley was doing it was almost in a demanding or needy sort of way. I spent a couple of minutes explaining how Wrigley’s guardian can use body language and movement to more affectively communicate with him. Because these movements were similar to how dogs communicate with one another, Wrigley responded to them right away. I suggested that the guardian start to practice asking Wrigley to give everyone personal space unless invited closer. I also recommended that she utilize the same movements and body language to establish boundaries around any human who is eating food or doing anything where they would like a little bit of space. Helping the dog learn to respect a boundary like this will go a long ways towards helping him develop more respect for the humans he lives with. I always look for ways to incorporate a little bit of structure into my client’s daily routine. Because the family has two young children I recommended that she start asking the dog to sit and wait while she ascended or descended the stairs. This may seem like a minor thing, but having a dog wait for the human to proceed first, then following on command incorporates several lessons into a simple activity. This sort of positive dog training is very easy and effective. Essentially this is a mini dog behavior training session that the guardians can engage in very frequently without spending much time or effort. Because the family has children in diapers, Wrigley was very interested in the trash. His guardians had purchased a trashcan with a lid to use in the kitchen and was utilizing a baby gate to keep him downstairs so he didn’t get into the trash in the upstairs bathroom. While both of these methods can prevent the dog from getting into the trash, it does not teach the dog that the trash is to be left alone in the first place. I spent a couple of minutes going over how Wrigley’s guardians can teach him to leave it alone. Wrigley’s guardians can apply this same technique to any object that he is not supposed to play with; baby toys, shoes, underwear, socks, etc. It may take a few timely corrections so I recommended the guardian “set him up” with access to it at times where she can give him her full attention. Wrigley is not a fat dog, but he could drop a couple of pounds. I recommended his guardian start chopping up 10 fresh green beans and add them to his kibble while reducing the amount of dog food. The fiber from the fresh green beans will help him feel full. I also suggested that she start walking him more often and longer as exercise will help him drop weight and behave inside. His guardian mentioned that he pulled on the leash to such an extent that she didn’t walk him as often as she would like to. I pulled out a Martingale collar and showed her how to attach it with a special twist of the leash to prevent him from pulling. It was awesome to see how quickly he responded. This sort of leash training will go a long ways towards helping Wrigley behave better and practice taking instruction from his humans. By the end of the session, Wrigley was showing respect for people’s personal space, no longer pulled on the leash, was not jumping up and already starting to follow some of the new rules we incorporated earlier.